The Pulse ... catering to young professionals. Work on an urban community development adjacent to the Expo 2020 site in Dubai is set to commence with the appointment of a contractor. An attractive, affordable community catering to families and young professionals, Dubai South’s Residential District includes schools, nurseries, hospitals, retail outlets, food and beverage (F&B) options, offices, swimming academy and a sports complex. The pedestrian-friendly, aesthetic, sustainable city is designed to ensure all amenities and necessities are well within walking distance, says the developer. Dubai South Residential District will have around 10,000 residential units - comprising villas, townhouses and apartments – by 2020, housing an estimated 35,000 residents. 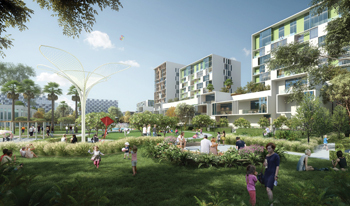 The Pulse is the first of a series of masterplanned residential communities by Dubai South. The deal for the residential buildings at The Pulse has been awarded to leading Emirati construction group Al Qabdah Building Contracting. “This entirely new and incomparable model puts people first and focuses on affordability while celebrating nature and diverse populations. This combination proved highly successful during sales in Q4 2016, where we surpassed our targets and achieved more than 90 per cent sales,” observes Al Zaffin. “In Al Qabdah, we have found the right partners to deliver the true experience of this unique community to our customers,” he adds. Al Zaffin reveals that more than Dh7 billion ($1.9 billion) will be pumped into real estate projects in Dubai South ahead of Expo 2020. “Of these, half the investments will be made by the master developer while the remaining half will come from private investors,” he adds. The masterplan includes The Pulse Mall, a shopping centre with a wide range of experiences – from a hypermarket, cinena halls, restaurants and cafés, fashion and a spacious fitness centre – besides two hospitality towers with 450 hotel keys opposite the mall with direct access to the main boulevard. The upcoming shopping destination is located in the heart of the community and within walking distance from all residences. The Pulse Mall is currently in the final design stage, and will be awarded to the contractor within the next four months with delivery scheduled for early 2020, says Dubai South. The two hospitality towers will be developed in two phases. A four-star lifestyle hotel and serviced apartments have also been incorporated into the project plan and are due to be completed and delivered in 2020, it adds.